Located on Ban Taling Ngam Beach, this resort offers a peaceful getaway with an outdoor pool. Guests enjoy free Wi-Fi. Sibaja Palms Sunset Beach Luxury Villa offers air-conditioning, plasma TVs with Netflix and Asian décor. Villas come with living and dining areas, and a fully equipped kitchen. The resort is a 15-minute drive from Nathon and Lamai Beaches. It is 40 minutes’ drive away from Chaweng Beach and Samui International Airport. Guests at Sibaja Palms can enjoy a relaxing massage, or relax in the pool. At an extra charge, staff can arrange airport transfers, shuttles services, or laundry services. When would you like to stay at Sibaja Palms Sunset Beach Luxury Villa ? This villa features ceiling fans and air-conditioning. It comes with a flat-screen TV with Netflix, a DVD player with free films, a washing machine and a fully-equipped kitchen. Please inform Sibaja Palms Sunset Beach Luxury Villa in advance of your expected arrival time. You can use the Special Requests box when booking, or contact the property directly with the contact details provided in your confirmation. Please note that guest are required to pay a deposit within 7 days after the day of booking, The property will contact guests directly via email with instructions. Please note that children under 6 years stay free of charge in an extra bed. The rates are inclusive of breakfast. 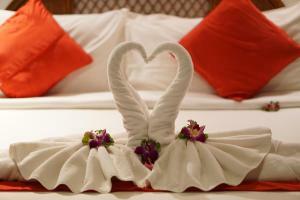 All further children (older than 6 years) or adults are charged THB 900 per night for extra beds. The villa can accommodate 2 extra beds. Each day we'll check prices and send you an email for your selected dates at Sibaja Palms Sunset Beach Luxury Villa. If you don't have specific dates but would like to check prices for say next weekend or say next month we can check the price too. Click to write a review and share your experience of Sibaja Palms Sunset Beach Luxury Villa with other travellers.